Every now and then, patients present to our office inquiring about treatment options for receding gums. They may have one tooth or even multiple teeth where the gum tissue has been lost causing the tooth to appear longer than other teeth. Sometimes, once this occurs, the tooth also becomes sensitive to temperature because the gum tissue is no longer encircling the root of the tooth. Gums can recede for multiple reasons. If you brush your teeth too vigorously or use a brush with hard bristles, you can push the gum tissue away from its optimal position. Gum disease can also lead to recession of the gums. Foreign objects like lip rings can cause trauma to the gum and cause it to recede. Also, if the space between your lips and teeth is very shallow or tight, this can contribute to loss of gum tissue. 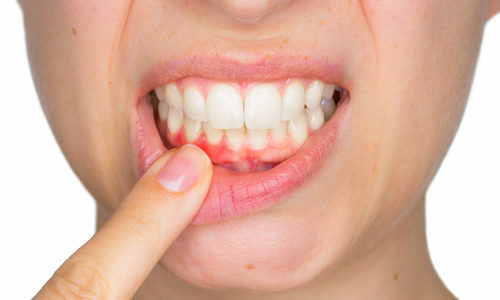 There is a small muscle or fold of tissue in the mouth, called a frenum, that connects your lip to the inside of the mouth. The position of this tissue can sometimes cause gum recession. Treatment for gum recession will depend on the cause. If toothbrush abrasion has contributed to the condition, your dentist will discuss proper brushing techniques and advise switching to a soft bristle brush. Gum disease would be addressed with the appropriate treatments such as deep cleaning, possibly in conjunction with gum and laser surgery. Removal of any lip rings would be advised. Gum recession caused by a shallow vestibule (which is the space between your lip and teeth) would be treated by gum repositioning surgery or by placing a gum graft over the exposed root. The graft is usually obtained from another part of the mouth, such as the palate. If a high frenum attachment is the cause, a frenectomy would be performed. This is done by using a laser to release the muscle attachments and allow them to heal and reattach in a better position. Whatever the cause, there are multiple treatment options to get your smile back in its best shape.